Under normal conditions you need to get up really early after (or during) a snowstorm to ski La Grave on untracked snow. This is especially true on the more popular routes. Getting to the top of your chosen itinerary first is not enough. You need to keep moving if you want to stay ahead of everybody else. 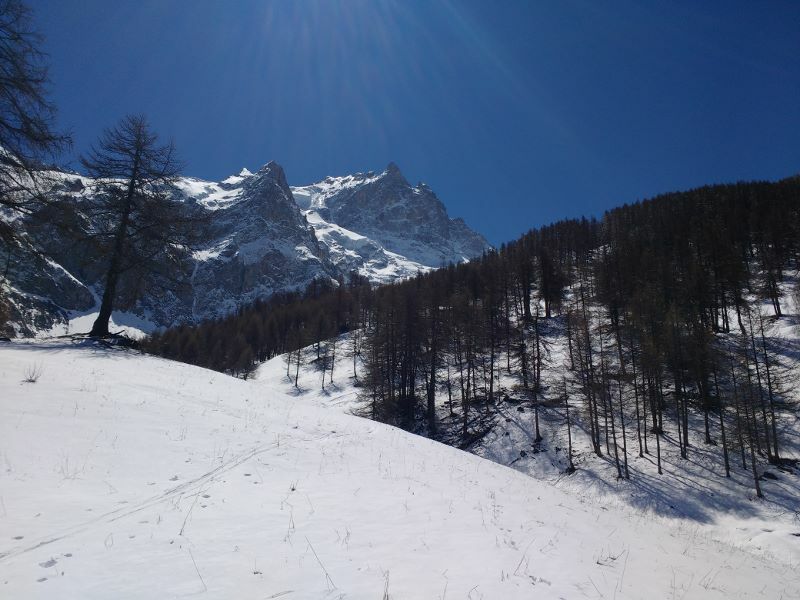 This post is about how we skied La Grave last Saturday in fresh powder and sunshine. Taking our time. With nobody else in sight. The secret? Wait until the lifts have closed. 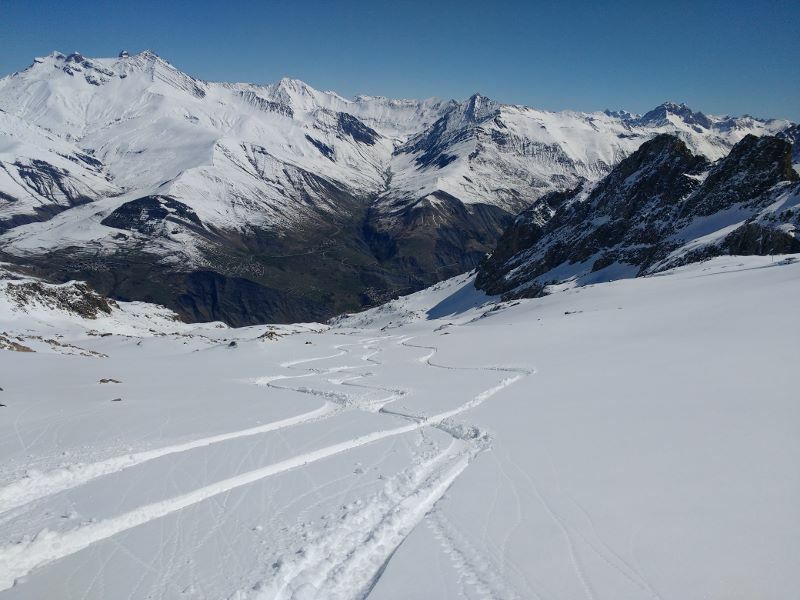 This year the La Grave lift shut a week before the Les Deux Alpes lifts, and that extra week saw a fair bit of fresh snowfall. With the sun forecast to return for the last day of the season, a plan was hatched. Leave a car in La Grave on Friday evening and ski down to it on Saturday. We would only get one run, but what a run it was going to be. Fresh snow, wind and a rise in temperature meant the avalanche potential was fairly high. Consequently, we resolved to stick to easier angled slopes. This meant passing by the tempting couloirs along the descent. Having this place entirely to ourselves is such a rare privilege that nobody objected. We had gone prepared to walk. Everybody carried climbing skins for their skis, in case the Lauze drag lift was closed, and the snowboarders took splitboards. We expected a long walk down from the end of the snow to the village too. In the event, Les Deux Alpes was open right to the top, and the snow got us down to P1, just a few hundred metres above La Grave. We stayed close to the shut lifts on the Girose glacier before heading left to the Col du Lac and joining the Chancel itinerary. The powder was light until almost at the Chancel refuge, and stayed good to ski all the way down. We skied pitch after pitch of untracked snow on a run that seemed to go on forever, yet was over all too soon. 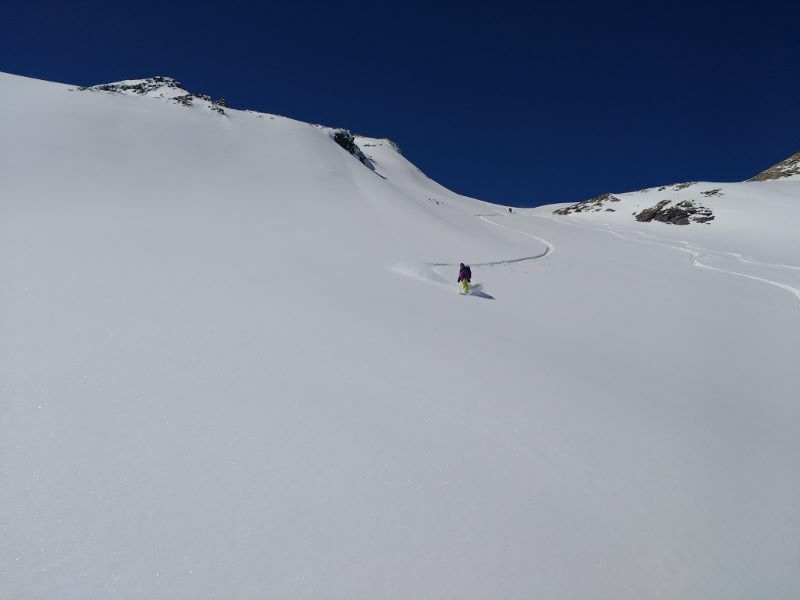 The last few turns to P1 were on thin snow with no base, and only the fact that there was grass rather than rock underneath allowed us to keep skiing. Lower mountain conditions were decidedly better than earlier in April when we had to walk to get to P1. The lift being shut meant that there was nobody behind us. We could take as long as we wanted, whilst keeping a close eye on the snow conditions. We only did one run, but we spent a good couple of hours over it. When we eventually arrived in La Grave, we headed for lunch at the one open restaurant. I have skied a lot of winters, and a lot of closing days, but this has to be the best way to finish a season that I can remember. This is the way to ski La Grave. 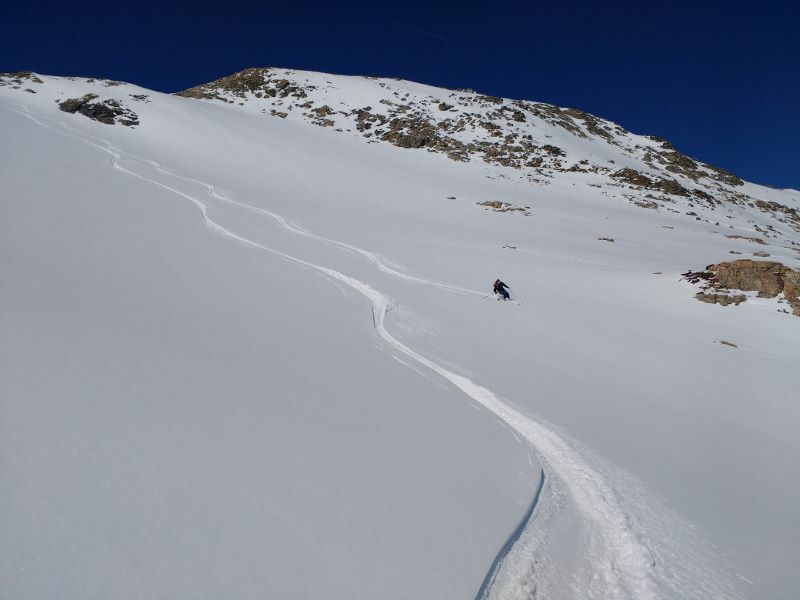 *There are plenty of other ‘best ways’ to ski La Grave. 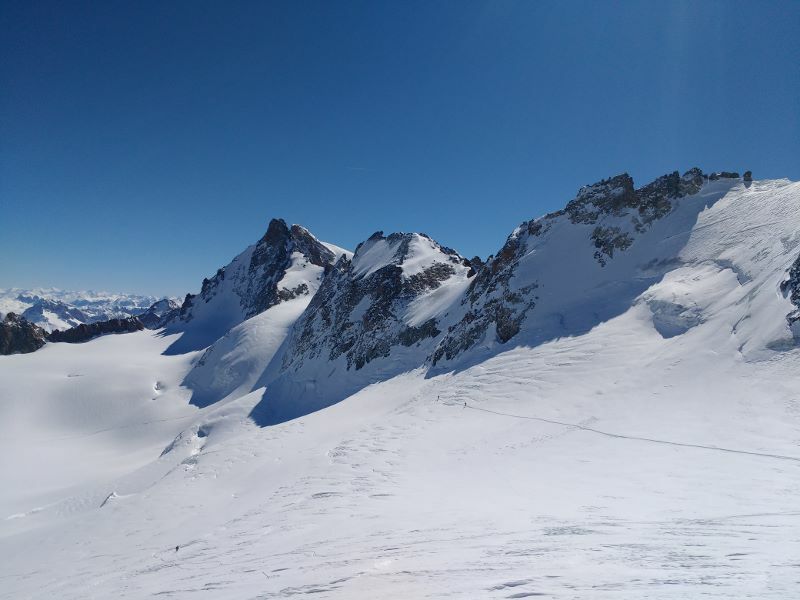 You could ski extreme couloirs, abseil into one of the road runs, overnight at the Chancel refuge and get up before the lift opens, set off on a multi-day ski tour, or ski two runs and spend the afternoon eating Tartiflette, drinking wine and soaking up the view of the Meije.